Choose the right bike bottle!Besides your helmet, this is the most important part of your bicycle. Preventing heat stroke and getting enough fluid should be your biggest concern. In a world of innovation, the cycling water bottle is an overly-standardized design. However, it works. And that's what matters. So here is a quick look at a "King of Water Bottle Designs" as well as two with innovative twists -- the Polar Water Bottle and the Camelback podium. Pick the one that works best for you and get ready to stay hydrated while cycling. All of the bottles reviewed on this page are BPA-free. BPA, or Bisphenol A, is a harmful chemical found in most plastics and has been linked to developmental disorders and is a known carcinogen. Unfortunately, it has not been banned by legislation, so it is up to the consumer to be educated. To that end, we have only reviewed BPA-free bottles. The "King" of Water Bottles? 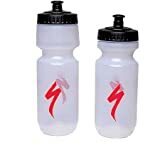 Specialized Cycling Products has filled a huge need in the cycling industry by popularizing a standard cycling water bottle design. I'm sure you've seen their water bottle: it has a nice, fat base for holding as much water as possible, a small indentation for making it easy to grasp and a pop-top water spout to make it easy for one-handed operation. Adding further to the Specialized’s water bottle’s popularity, is their ability to print logos on it. Bike shops and business buy up hundreds of these bottles with a customer logo, and then give them away or sell them at a discount. Customers love them and the word-of-mouth gets spread. If you’ve ever watched one of the major cycling races on TV, such as the Tour de France, you have seen thousands of these bottles being discarded by the riders. For the racing cyclist, it makes sense to throw away the empty bottles. It is not insulated. Many people love cold drinks of water when they work out. My wife, for example, will hardly drink lukewarm water. If you are one of those people who needs plenty of cold water in order to stay hydrated while exercising, then you may want to get an insulated bottle that can do that like the Polar Insulated bottle reviewed below. Another trick to fill the water bottle less than half-way with water and freeze it. Then, you can add the rest of the water on top. It’s important to make sure to leave enough space for water on top so that you can stay hydrated while the bottom part melts. When you are ready for a cold drink anytime, anywhere. When it is 90+ degrees outside, your body will already be fighting to stay cool. On top of that, you, as a cyclist, is pedalling for all you can. Are you crazy? Probably. But staying hydrated will help keep you from causing permanent brain damage. Cold water can be the perfect thing to not only quench your thirst, but to also cool your body. And there are no better water bottles for the task than the polar bottle. The polar bottle is a little taller than most other water bottles (which enables it to carry the same amount of fluid and still be insulated) but it fits well into normal water bottle cages. And, it works extremely well. I have had fluids stay cold for a four hour ride on hot day in one of these bottles. Plus, they come in a ton of different colors so its pretty easy to get a color to match your bike. 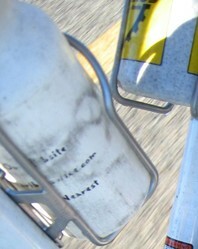 One rider I know matches their jersey to their polar bottles every time they ride. It’s quite the fashion statement. Camelback is a well-known brand for all things hydration. Their mountain bike and hiking hydration packs are the most reliable on the market and are even used by the military to keep the world's elite fighters hydrated in tough, hot circumstances. Camelback’s entry to the cycling water bottle market has been slowly evolving over the past few years. They have now developed one of the best water bottles on the market. What really sets the Camelback Podium Bottle apart is its twist-top spout. It seals more tightly than the other two bottles with a push-top spout, which means it won’t be dribbling all over your car if it gets knocked over. And, you can still open the bottle with one hand by gripping the spout with your teeth -- just like you do with the other two bottles. In short, I think that the Camelback podium bottle has a chance to finally unseat the long undispusted king. Specialized Big Mouth, Polar Insulated, or Camelback Podium? Its up to you to decide which one will serve your riding needs. I hope this article has helped. No matter what you choose, I hope you will join the thousands of Americans that are switching to reusable bottles and decreasing their dependence on plastic bottles that are clogging our landfills and turning out oceans into plastic. Other Cycling Articles from the LostCyclingDude's Cycling Channel! I was hesitant to convert to a CO2 inflator. But I'm a believer now. Co2 Inflators are easy to use. Here's the why and how. Plus some bike shop secrets for preventing flats. Christmas is not the only holiday that has inflatable decorations. Halloween has numerous and elaborate displays to enhance your Halloween experience. Time for a movie break? Relive this awesome event.